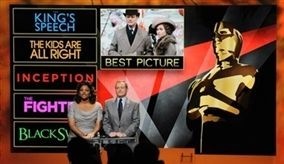 "The King’s Speech" (El discurso del rey), un drama británico que narra los esfuerzos del monarca Jorge VI por superar su tartamudez antes del inicio de la Segunda Guerra Mundial, encabezó el martes las candidaturas a los Oscar con 12 nominaciones. "True Grit", un western sobre la intrépida tarea de una joven por encontrar a los asesinos de su padre, le sigue con 10 candidaturas. El thriller de ciencia ficción "Inception" y el drama sobre el origen de Facebook "The Social Network" aspiran a ocho estatuillas cada una. La edición 83 de la entrega de los premios de la Academia de las Ciencias y las Artes se celebrará en Hollywood el 27 de febrero. 1. Mejor película: "Black Swan", "The Fighter", "Inception", "The Kids Are All Right", "The King’s Speech", "127 Hours", "The Social Network", "Toy Story 3", "True Grit", "Winter’s Bone". 2. Actor: Javier Bardem, "Biutiful"; Jeff Bridges, "True Grit"; Jesse Eisenberg, "The Social Network"; Colin Firth, "The King’s Speech"; James Franco, "127 Hours". 3. Actriz: Annette Bening, "The Kids Are All Right"; Nicole Kidman, "Rabbit Hole"; Jennifer Lawrence, "Winter’s Bone"; Natalie Portman, "Black Swan"; Michelle Williams, "Blue Valentine". 4. Actor de reparto: Christian Bale, "The Fighter"; John Hawkes, "Winter’s Bone"; Jeremy Renner, "The Town"; Mark Ruffalo, "The Kids Are All Right"; Geoffrey Rush, "The King’s Speech". 5. Actriz de reparto: Amy Adams, "The Fighter"; Helena Bonham Carter, "The King’s Speech"; Melissa Leo, "The Fighter"; Hailee Steinfeld, "True Grit"; Jacki Weaver, "Animal Kingdom". 6. Director: Darren Aronofsky, "Black Swan"; David O. Russell, "The Fighter"; Tom Hooper, "The King’s Speech"; David Fincher, "The Social Network"; Joel Coen y Ethan Coen, "True Grit". 7. Película extranjera: "Biutiful", México; "Kynodontas" ("Colmillos"), Grecia; "Hævnen", Dinamarca; "Incendies", Canadá; "Hors-la-loi", Argelia. 8. Guión adaptado: Danny Boyle y Simon Beaufoy, "127 Hours"; Aaron Sorkin, "The Social Network"; Michael Arndt, John Lasseter, Andrew Stanton y Lee Unkrich, "Toy Story 3"; Joel Coen y Ethan Coen, "True Grit"; Debra Granik y Anne Rosellini, "Winter’s Bone". 9. Guión original: Mike Leigh, "Another Year"; Scott Silver, Paul Tamasy, Eric Johnson y Keith Dorrington, "The Fighter"; Christopher Nolan, "Inception"; Lisa Cholodenko y Stuart Blumberg, "The Kids Are All Right"; David Seidler, "The King’s Speech". 10. Largometraje animado: "How to Train Your Dragon", "The Illusionist", "Toy Story 3". 11. Dirección de arte: "Alice in Wonderland", "Harry Potter and the Deathly Hallows Part 1", "Inception", "The King’s Speech", "True Grit". 12. Cinematografía: "Black Swan", "Inception", "The King’s Speech", "The Social Network", "True Grit". 13. Mezcla de sonido: "Inception", "The King’s Speech", "Salt", "The Social Network", "True Grit". 14. Edición de sonido: "Inception", "Toy Story 3", "Tron: Legacy", "True Grit", "Unstoppable". 15. Música original: "How to Train Your Dragon", John Powell; "Inception", Hans Zimmer; "The King’s Speech", Alexandre Desplat; "127 Hours", A.R. Rahman; "The Social Network", Trent Reznor y Atticus Ross. 16. Canción original: "Coming Home" de "Country Strong", Tom Douglas, Troy Verges y Hillary Lindsey; "I See the Light" de "Tangled", Alan Menken y Glenn Slater; "If I Rise" de "127 Hours", A.R. Rahman, Dido y Rollo Armstrong; "We Belong Together" de "Toy Story 3", Randy Newman. 17. Vestuario: "Alice in Wonderland", "I Am Love", "The King’s Speech", "The Tempest", "True Grit". 18. Largometraje documental: "Exit through the Gift Shop", "Gasland", "Inside Job", "Restrepo", "Waste Land". 19. Documental corto: "Killing in the Name", "Poster Girl", "Strangers No More", "Sun Come Up", "The Warriors of Qiugang". 20. Edición: "Black Swan", "The Fighter", "The King’s Speech", "127 Hours", "The Social Network". 21. Maquillaje: "Barney’s Version", "The Way Back", "The Wolfman". 22. Cortometraje animado: "Day and Night", "The Gruffalo", "Let’s Pollute", "The Lost Thing", "Madagascar, carnet de voyage (Madagascar, a Journey Diary)". 23. Cortometraje: "The Confession", "The Crush", "God of Love", "Na Wewe", "Wish 143". 24. Efectos visuales: "Alice in Wonderland", "Harry Potter and the Deathly Hallows Part 1", "Hereafter", "Inception", "Iron Man 2".